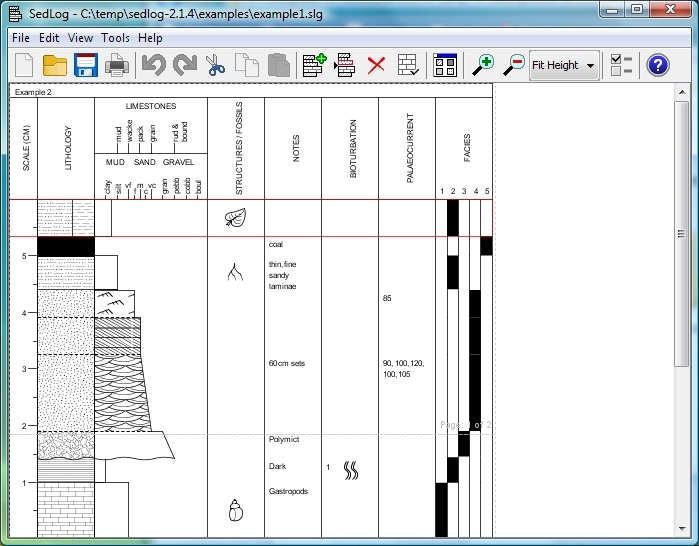 SedLog is a multi-platform software for creating graphic sediment logs. Is designed by geologists for geologists. It provides an intuitive graphical user interface, making it very easy for anyone to use with minimum effort. The graphic sediment logs generated by SedLog can be exported as PDF, SVG, or JPEG for use by other drawing applications or for publications. Log data can be imported and exported in CSV format. Graphic logs can also be printed to any paper size the user wants. Zoom In, Zoom Out, Fit page, Fit Height and Fit Width facilities are also provided to enable the user to customise the workspace size. The SEDLOG software can be used for research and teaching without charge. News: YouTube video (opens in new window) providing a walkthrough of the use of SedLog. "SedLog: a shareware program for drawing graphic logs and log data manipulation", D. Zervas, G.J. Nichols, R. Hall, H.R. Smyth, C. Lüthje and F. Murtagh, Computers & Geosciences, 35, 2151-2159, 2009.